1. Customers can search for, but not book, accessible rooms. I thought the point was to be able to book them? Look at the booking engine for Expedia below. I did a mock booking of a hotel in Boston, and Expedia lets you “select” your “options,” but this is deceptive. 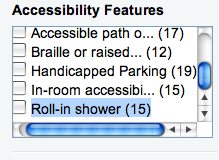 Because an Expedia customer service rep has to then call the hotel to confirm availability of say, a roll-in shower. 2. There’s no guarantee you’ll get an accessible room. Expedia says that if a room is available, you will receive a confirmation email. If it’s not, well, you are going to have to book a different room, at a potentially higher price. Says Expedia: “Accessibility arrangements are not guaranteed and may incur additional fees.” They also forgot to take out the old “Special requests” window, which is where disabled travelers pleaded their case before the lawsuit came along. 3. Yes, there was a lawsuit. Expedia.com of Bellevue, Wash., and its subsidiary, Hotels.com, are making these concessions as part of a Americans with Disabilities Act lawsuit settlement. In the class-action lawsuit, which was filed in Oakland, Calif., the plaintiffs say they traveled often with a dance troupe for people with and without disabilities and found that wheelchair-accessible rooms weren’t guaranteed. 4. The ADA already covers most of these accessibility feaures. Telephone equipment for the deaf? Handicapped parking? Does Expedia really believe that without their efforts, we wouldn’t be able to find either of these in our hotels? 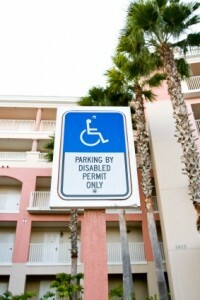 The ADA requires hotels to have telephone kits for the deaf, and handicapped parking is, well, ubiquitous. What about the more hard-to-find features, like short stature accessibility kits that are in use by some Wyndham chains. Or lowered peep holes for guests in wheelchairs. There is a value in being able to search for rooms with roll-in showers as some of the boutique or older hotels don’t have these yet. But I suspect all the big chains, like Hilton and Marriott do — so just book there. 5. The accessibility box is hard to find. On Hotels.com, I have to scroll down and I can’t even make out what these features are: What’s “Accessible path o…?” I wrote to Dan Guarino, the PR person for Hotels.com to ask about this, but he never got back to me. 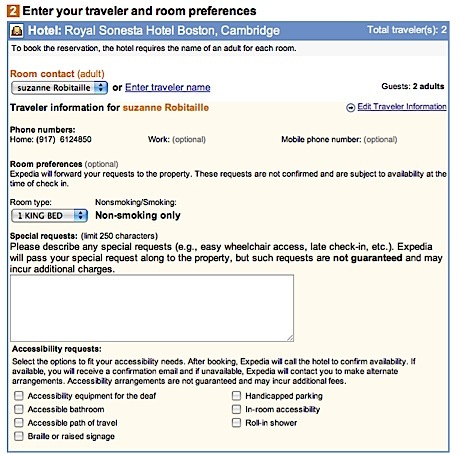 Overalll, I think Expedia satisfied the ramifications of its lawsuit settlement but I would like to see them work with hotels to integrate accessibility booking right into the search engine. I’d like to see more features and explanations of what each feature offers to a guest. I’d also like some rankings of which hotels do better than others in terms of accessibility. That, would be a value-added service that people with disabilities would truly embrace. Hi! At the Holiday Inn Brookline we have big handicapped rooms! Give us a call at 617-277-1200 to book your reservation. We would be so glad to accommodate you!